A research guide that contains information on different citation styles and examples on how to use them. Welcome to the Citation Guide! This guide will show you how to create citations directly in the text of your assignment and how to organize references. If you are unsure which style to use, aks your professor for a recommendation. Please contact the librarian if you have any questions about how to use any of the resources mentioned in this guide. 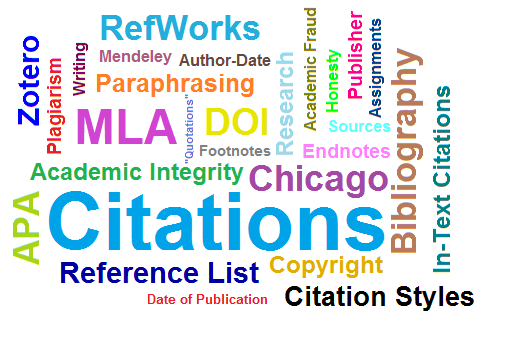 What are citations and references? Citations and references indicate where a piece of information was found and who is responsible for it. Citations are presented in the text of your assignment. They are short and help the reader find the complete reference in the bibliography. References can be found in the bibliography at the end of an assignment. For every citation there is a corresponding reference. A bibliography is a list of works that were used during the research and writing of the assignment. To give credit to the person responsible for the information. When to cite and reference? Any time you present someone else's ideas, words or you summarize their findings in your assignment, you must cite and reference. If you use another person's exact words: use quotation marks (" "), follow with a citation and a corresponding reference in the bibliography. If you use another person's idea: paraphrase, follow with a citation and a corresponding reference in the bibliography. For more information, consult the plagiarism guide.